Introduction: The text of this article is taken from a 31-page pamphlet bound in a volume of unrelated material in the Science, Industry and Business Library of the New York Public Library. It has no indication of publisher or date; the NYPL catalog lists its date as 189?. 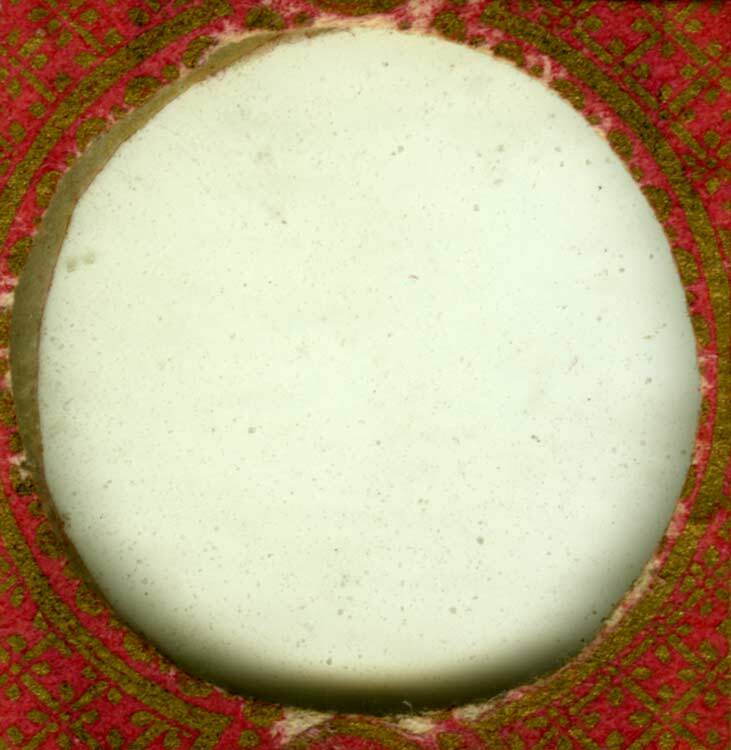 The Library of the Public Archives of Canada also holds a copy, noted as disbound and dated 1867?. The text is taken almost verbatim (with some minor rewriting) from Henry Field’s 1892 book The Story of the Atlantic Telegraph, itself a revised version of the same author’s History of the Atlantic Telegraph, first published in 1866 and with two further enlarged editions in 1867 and 1869. The story of the recovery of the lost cable does not appear in the 1866 edition; it seems likely that it would have appeared in the 1867/69 editions. “Deane”, whose diary of the 1866 expedition is extensively quoted in Henry Field’s book, is John C. Deane, Secretary of the Anglo-American Telegraph Company. He was also on the 1865 Great Eastern expedition. Note: The illustrations are contemporary, but from other sources. THE little harbor in Newfoundland that bears the gentle name of Heart’s Content, is a sheltered nook where ships may ride at anchor, safe from the storms of the ocean. It is but an inlet from that great arm of the sea known as Trinity Bay, which is sixty or seventy miles long, and twenty miles broad. On the beach is a small village of some sixty houses, most of which are the humble dwellings of those hardy men who vex the Northern seas with their fisheries. The place was never heard of outside of Newfoundland till 1864, when Mr. Field, sailing up Trinity Bay in the surveying steamer Margaretta Stevenson, Captain Orlebar, R. N., in search of a place for the landing of the ocean cable, fixed upon this secluded spot. The old landing of 1858 was at the Bay of Bull’s Arm, at the head of Trinity Bay, twenty miles above. Heart’s Content was chosen now because its waters are still and deep, so that a cable skirting the north side of the banks of Newfoundland, can be brought in deep water almost till it touches the shore. All around the land rises to pine-crested heights; and here the telegraphic fleet, after its memorable voyage, lay in quiet, under the shadow of the encircling hills. But though their voyage was ended, they were not idle. Those few days in port were quite as busy as the days at sea. Having crossed the Atlantic, the first thing was to open communication with the great States and cities of the Union. And now Mr. Field was extremely mortified to find that there was a large gap in the line this side of the ocean. His first question to the Superintendent, who came out in a boat to meet him, was in regard to the cable across the Gulf of St. Lawrence, which had been interrupted the year before; and it was a bitter pang to hear that it lay still broken, so that a message which came from Ireland in a moment of time, was delayed twenty-four hours in its way to New-York. Of course the public grew impatient, and there were many sneers at the want of foresight which bad failed to provide against such a contingency; and, as he was the one chiefly known in connection with the enterprise, these reproaches fell upon him. He did not tell the public, what was the truth, that he had anticipated this very trouble long ago, and entreated his associates to be prepared for it. 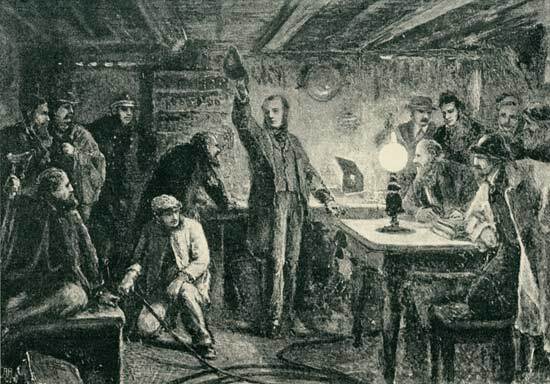 Months before he left for England, he urged upon the Company in New-York the necessity of rebuilding their lines in Newfoundland, which had been standing over ten years, and of repairing the old cable, and also laying a new one across the Gulf of St. Lawrence. But this would cost a very large sum of money, and as their faith and purses had been sorely tried by repeated disasters, they were not willing to spend so heavily in the uncertainty of the future. They wished, very naturally, to see the result of this new expedition, before advancing further capital. We do not blame them, but only mention the fact to show that Mr. Field had foreseen this very thing, and endeavored to guard against it. But regrets were idle. What could he do to repair the injury? “Is there a steamer,” he asked, “to be had in these waters?” “The Bloodhound is at St. John’s.” “Telegraph instantly to charter her to go around to the Gulf of St. Lawrence, and fish up the old cable and repair it. But that may take several weeks. Is there nothing else that can serve in the mean time to carry dispatches across the Gulf?” “There is a little steamer, called the Dauntless.” “Well, telegraph for her too. Secure her at all hazards; only see that the work is done.” All this was the work of a few minutes. The answers came back quickly, and in a day or two came the steamers themselves. The arrangement was immediately carried out. The Dauntless took her place in the Gulf, where she made her regular trips from Port au Basque, in Newfoundland, to Aspee Bay, in Cape Breton, keeping up daily communication with the States. 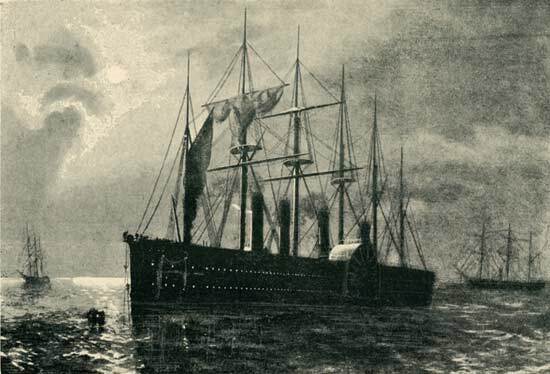 The Bloodhound, which had a more difficult task, first took on board eleven miles of cable from the Great Eastern, to repair the broken line, and then sailed under charge of Mr. A. M. Mackay, the indefatigable Superintendent of the Company in Newfoundland, who has had the care of their lines for ten years, and has given constant proof of his diligence and fidelity. He sailed for Aspee Bay, and made short work of the business. In a few days he had dragged the Gulf and raised the cable, which he found had been broken by an anchor, in water seventy fathoms deep, a few miles from shore. This was spliced out with a portion of the new cable, and the whole was as perfect as ever, thus giving a fresh proof that cables well made are likely to be permanent, if not indestructible. While the Great Eastern was lying in the harbor of Heart’s Content, she was overrun with visitors. The news of her arrival had spread over the island, and from far and near the people flocked to see her. Over the hills they came on foot and on horseback, and in wagons and carts of every description; and from along the shore in boats and fishing-smacks, and sloops and schooners. Thus they came from the most remote parts of the island—a distance of 300 miles—and even from the province of New-Brunswick. Several parties made the excursion in steamers from St. John’s. Thus for two weeks the little harbor was alive with the many and strange craft that brought the people to see that great sight. They climbed up the sides of the ship, and wandered for hours through its spacious rooms and long passages. All were welcomed with true and hearty sailor courtesy. But the Great Eastern was not here on a voyage of pleasure, nor did all these receptions delay for an hour the preparations for her departure. She had another work on hand greater than before. 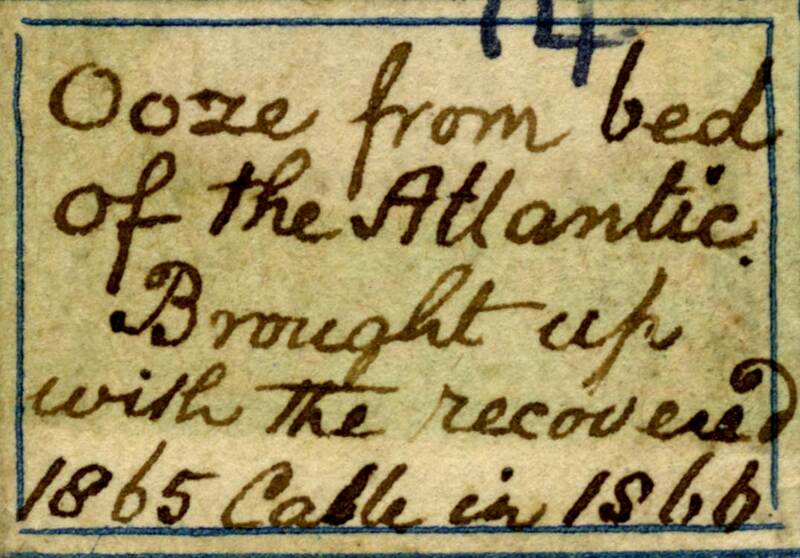 Though she had done enough to be “laid up” for a year, still she had one more test of her prowess—to recover the cable of 1865, which had been lost in the middle of the Atlantic. So eager were all for this second trial of their strength, that in less than five days two of the ships—the Albany and the Terrible—the vanguard of the telegraphic fleet, were on their way back to mid-ocean. Though it was only Friday, the 27th of July, that they reached land, they left early Wednesday morning, the first clay of August. The Great Eastern was detained a week longer. She had to lay in immense supplies of coal. Anticipating this want, six ships had been dispatched from Cardiff; in Wales, weeks before, to await the arrival of the fleet. One of these foundered at sea, the others arrived out safely; and hardly had the Great Eastern cast anchor before they were alongside, ready to fill her bunkers. So ample was the provision, that, when she went to sea a few days after, she had nearly eight thousand tons of coal on board. At the same time she had to receive some six hundred miles of the cable of 1865, which had been shipped from England in the Medway. The latter was now brought alongside, and the whole was transferred into the main tank of the Great Eastern, from which it was to be paid out in case the lost end were recovered. At length all those preparations were completed, and, on Thursday, the 9th of August, the Great Eastern and the Medway put to sea. The Governor of Newfoundland, who had come around from St; John’s and been received with the honors clue to his rank, accompanied them in the Lily down the broad expanse of Trinity Bay, and then bore away for St. John’s, while the Great Eastern and Medway kept on their course to join their companions in the middle of the Atlantic. They had a little over six hundred miles to run to the “fishing ground,” and made it in three days. On Sunday noon they came in sight of the appointed rendezvous, and soon with glasses made out the Albany and the Terrible, which had arrived a week before and placed buoys to mark the line of the cable, and then, like giant sea-birds with folded wings, sat watching their prey. The sea was running high, so that boats could not come off, but the Albany signalled that she had not toiled for nothing; that she had once hooked the cable, but lost it in rough weather. The history of this first attempt, though brief, was cheering. When the Albany left Heart’s Content, Captain Moriarty went in her. He had been in the Great Eastern the year before and saw where the cable went down, and had had his eye on the spot ever since. He claimed, with Captain Anderson, that he could go straight to it and place the ship within half a mile of where it went down. At this old sailors shook their heads, and said, “They’d like to see him do it;” “No man could come within two or three miles of any given place in the ocean.” Yet the result proved the exactness of his observations. With unerring eye he went straight to the spot, and set his buoys as exactly as a fisherman sets his nets. In the Albany, also, had gone Mr. Temple, of Mr. Canning’s staff. The ship had been fitted up with a complete set of buoys and apparatus for grappling; and he was full of ambition to recover the cable before the Great Eastern should come up. In this he had nearly proved successful. They had caught it once, and raised it a few hundred fathoms from the bottom, and buoyed it, but rough weather came on and tore away the buoy, so that the cable went down again, carrying two miles of rope. This was a disappointment, but still, as their first attempt was only “a feeler,” the result was encouraging. It showed that they had found the right place; that the cable was there; that it had not run away or been floated off by those under-currents that exist in the imagination of some wise men of the sea; nor that it was so imbedded in the ooze of the deep as to be beyond reach or recovery. All this was cheering, but as it promised to be a more difficult job than they had supposed, they were glad when the Great Eastern hove in sight that Sunday noon. 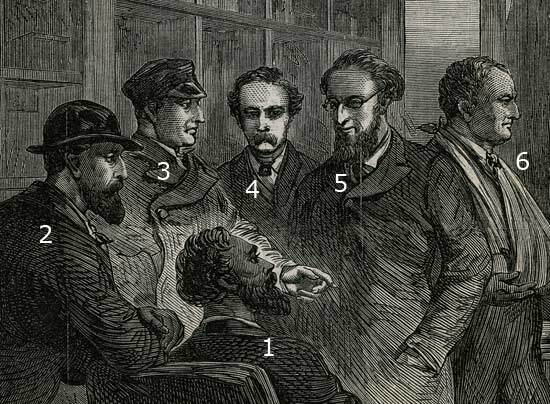 The next morning Captain Moriarty and Mr. Temple came on hoard, and after reporting their experience, the chief officers of the Expedition held a council of war before opening the campaign. The fleet was now all together, the weather was favorable, and it was determined at once to proceed to business. As the attempt is now to be renewed on a grand scale, the reader may wish some further details of the means employed to insure success. As nothing in this whole enterprise has excited such astonishment, nothing merits a more careful history. When it was first proposed to drag the bottom of the Atlantic for a cable lost in waters two and a half miles deep, the project was so daring that it seemed almost impious—a war of the Titans upon the gods. Yet never was any thing undertaken less in the spirit of reckless desperation. The cable was recovered, as a city is taken by siege—by slow approaches, and the sure and inevitable result of mathematical calculation. Every point was studied beforehand—the position of the broken end, the depth of the ocean, the length of rope needed to reach the bottom, and the strength required to lift the enormous weight. To find the place was a simple question of nautical astronomy—a calculation of latitude and longitude. 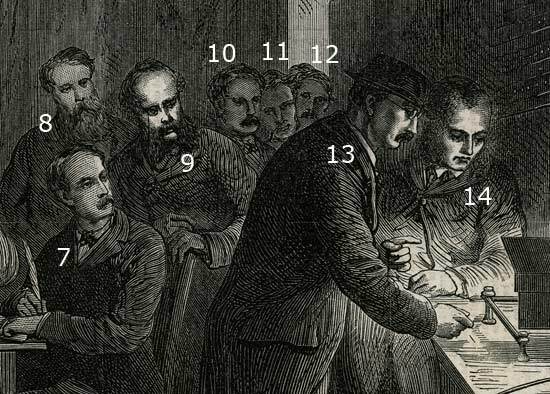 It seemed providential that, when the cable broke on the second of August, 1865, it was a few minutes after noon; the sun was shining brightly, and they had just taken a perfect observation.. This made it much easier to go back to the place again. The waters were very deep, but that they could touch bottom, and even grapple the cable, was proved by the experiments of the year before. But could any power be applied which should lift it without breaking, and bring it safely on board? This was a simple question of mechanics. Prof. Thomson had made a calculation that in raising the cable from a depth of two and a half miles, there would be about ten miles of its length suspended in the water. Of course, it was a very nice matter to graduate the strain so as not to break the cable. For this it had been suggested that two or three ships should grapple it at once, and lifting it together, ease the strain on any one point—a method that we shall see was finally adopted with success. With such preparations, let us see how all this science and seamanship and engineering are applied. The ships are now all together in the middle of the Atlantic. The first point is achieved—they have found the place where the broken cable lies—they have laid their hands on the bottom of the ocean and “felt of it,” and know that it is there. The next thing is to draw a line over it, to mark its course, for in fogs and dark nights it cannot be traced by observations. The watery line is therefore marked by a series of buoys a few miles apart, which are held in position by heavy mushroom-anchors, let down to the bottom by a huge buoy-rope, which is fastened at the top by a heavy chain. Each buoy is numbered, and has on the top a red ball with a black star over it, and a flag flying, which can be seen at a distance. Thus the ships, ranging around in a circuit of many miles, can keep in sight this chain of sentinels. Every buoy has also a lantern placed upon it at night, and these scattered lights gleam afar upon the ocean. Having thus fixed their bearings, the Great Eastern stands off, north or south according to the wind or current, three or four miles from where the cable lies, and then, casting over the grapnel, drifts slowly down upon the line, as ships going into action reef their sails, and drift under the enemy’s guns. that brought up the Cable of 1865. And thus, with fishing-lines all set, the great ship moves slowly down over where the cable lies. As the grapnel drags on the bottom, one of the engineer’s staff stands at the dynamometer to watch for the moment of increasing strain. A few hours pass, and the index rises to eight, ten, or twelve tons, sure token that there is something at the end of the line—it may be the lost cable, or a sunken mast or spar, the fragment of a wreck that went down in a storm that swept the Atlantic a hundred years ago. And now the engine is set in motion, to haul in. As the rope comes up, it passes over a five feet drum, every revolution bringing up three fathoms. Thus it takes some hours to haul in over two miles’ length, perhaps at last to find nothing at the end! These different experiments revealed some secrets of the ocean. Its bottom proved to be generally ooze, a soft slime. When the rope went down, one or two hundred fathoms at the end would trail on the sea floor; and when it came up, this was found coated with mud, “very fine and soft like putty, and full of minute shells.” But it was not all ooze at the bottom of the sea, even on this telegraphic plateau. There were hidden rocks—perhaps not cliffs and ledges, but at least scattered boulders, lying on that broad plain. Sometimes the strain on the dynamometer would suddenly go up three or four tons, and then back again, as if the grapnel had been caught and broken away. Once it came up with two of its hooks bent, as if it had cone in contact with a huge rock. At one time it brought up in the mud a small stone half the size of an almond; and at another a fragment as large as a brick. This was a piece of granite. The appearance of the cable woke a tremendous hurrah from all on board. They cheered as English sailors are apt to cheer when the flag of an enemy is struck in battle. But their exultation came too soon. The strain on the cable was already mounting up to a dangerous point. Capt. Anderson and Mr. Canning were standing on the bow, and saw that the strands were going. They hastened men to its relief, but it was too late. Before they could put stoppers on it to hold it, it broke close to the grapnel, and sunk to the bottom. It had been in sight but just five minutes, and was gone. Instantly the feeling of exultation was turned to one of disappointment, and almost of rage, at the treacherous monster, that lifted up its snaky head from the sea, as if to mock its captors, and instantly dived to the silence and darkness below. It was a cruel disappointment. Yet when they came to think soberly, it was not a cause for despair, but rather for new confidence and hope. It showed them what they could do. But this detained them in the middle of the Atlantic for two weeks more. It were idle to relate all the attempts of those two weeks. Every day brought its excitement. Whenever the grapnel caught, there was a suspense of many hours till it was brought on board. Several times they seemed on the point of success. Two days after that fatal Friday, on Sunday, August 19th, they caught the cable again, and brought it up within a thousand fathoms of the ship, and buoyed it. But Monday and Tuesday were too rough for work, and all their labor was in vain. Thus it was a constant battle with the elements. Sometimes the wind blew fiercely and drove them off their course. Sometimes the buoys broke adrift and had to be pursued and taken. Once or twice the boatswain’s mate—a brave fellow, by the name of Thornton—was lowered in ropes over the bow of the ship and let down astride of a buoy, and though it spun round with him like a top, and his life was in danger, he, held on and fastened a chain to it, by which it was swung on board. The continued bad weather was the chief obstacle to success. 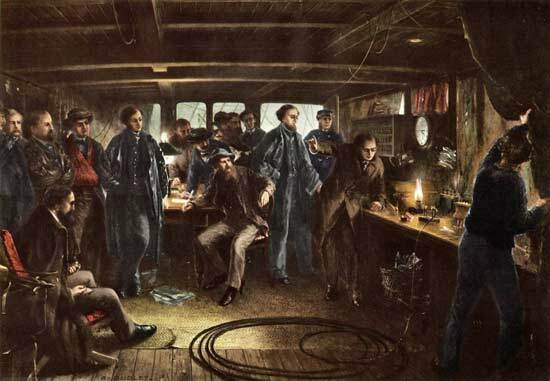 Engineers had often grappled for cables in the North Sea and the Mediterranean; but there they could look for at least a few days when the sea would be at rest; but in the Atlantic it was impossible to calculate on good weather for twenty-four hours. For nearly four weeks that they were, at sea, they had hardly four days of clear sunshine, without wind. Often the ocean was covered with a driving mist, and the ships, groping about like blind giants, kept blowing their shrill fog-trumpets, or firing guns, as signals to their companions that they were still there. Occasionally the sun shone out from the clouds, and gave them hope of better success. Once or twice we find in the private journal kept by Mr. Field, that it was “too calm;” there was not wind enough to drift the ship over the cable, so that the rope hung up and down from the stern, without dragging. One Sunday night he remembers especially, when the deep was hushed to a Sabbath stillness, the moon was shining brightly, and the ships floating over a “sea of glass,” suggested to many at that solemn hour thoughts of a better world than this. Such times gave them fresh hopes, that in a few hours were likely to be disappointed. Once, however, the Albany, which had been off a few miles fishing on its own hook, suddenly appeared in the night, reporting a victory. All on board the Great Eastern were startled by the firing of guns. It was a little after midnight, and Mr. Field had gone below, worn out with the long suspense and anxiety, when Capt. Anderson came rushing to his state-room with tidings that the cable was recovered! Both hurried on deck, and sure enough there was the Albany bearing down upon them, with her crew cheering in the wildest manner. The gallant Temple had conquered at last. But the next morning brought a fresh disappointment. They had indeed got hold of the cable, and brought its end on board, and afterward buoyed it, but when the Great Eastern went for it, it proved to be only a fragment some two miles long, which had been broken off in one of the previous grapplings. However, they hauled it in, and kept it with pride, as their first trophy from the sea. And so the days and weeks wore on; it was near the end of August, and still the prize was not taken. The courage of the men did not fail, but they were becoming worn out. The tension on their nerves of this long suspense was terrible. On Tuesday, August 28th, Mr. Temple was brought on board from the Albany, very ill. He was worn out with constant watching. Their resources, too, must in time be exhausted. On the evening of the 29th, Capt. Commerell, of the Terrible, came on board, and reported the condition of his ship. This was one of the very best officers in the fleet. He was full of zeal, courage, and activity, (having a good right hand in his first officer, Mr. Curtis,) and always kept up a brave heart, even in the darkest days. But his supplies were nearly exhausted. He had been out four weeks, and his coal was almost gone, and his men were on half rations. So he must leave the fishing ground for fresh supplies. It was a painful necessity. He mourned his fate, like a brave officer who is ordered away in the midst of a battle. But he submitted only with a determination to take in ammunition, and to come back in a few days to renew the struggle. Accordingly, the Terrible left the same evening for St. John’s. At the same time it was decided that the three other ships should leave their present cruising ground, and try a new spot. As an old fisherman, who has cast his line in one place so often as to scare the fish away, sometimes has better luck in other waters, so they proposed to go cast a hundred miles, to a place where the ocean was not quite so deep. Deane, in his Diary, calls it “the sixteen hundred fathom patch,” but they found it nineteen hundred fathoms, or about two miles! So the next morning the Great Eastern, the Medway, and the Albany “pulled up stakes,” that is, took in their buoys, and bore away to the east. In a few hours they reached the appointed rendezvous, and had set their buoys. The last day of August had come, and all seemed favorable for a final attempt. It was a clear day, with no wind. The sea had gone down, so that at noon it was a dead calm, as the three ships took their position in line, about two miles apart, ready to open their broadsides at once. The grapnel goes over for the thirtieth time. Kind heaven favors its search, and at ten minutes before midnight it has found the cable, and fastened its teeth never to let go. Feeling something at the end of the rope, they begin to haul in, but slowly at first, as an expert angler decoys a big fish by pulling gently on the line. Watching the dynamometer, they see with delight the strain increase with every hundred fathoms. Up it goes to eight, nine, ten tons! Now they have caught it, and no mistake. In about five hours they have drawn it up to within a thousand fathoms of the top of the water, where it hangs suspended from the ship. But now comes the critical point, for as it approaches the surface the danger of breaking increases every moment. It requires delicate handling. 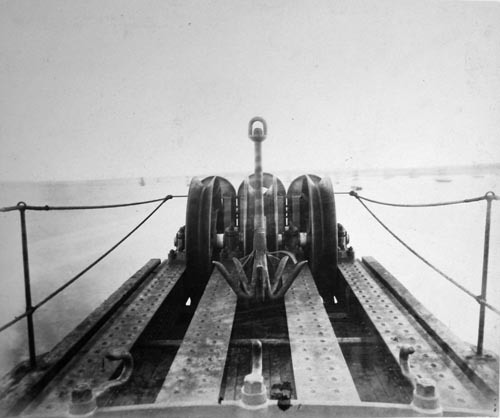 To make sure this time, the Great Eastern buoys the cable, and moves off two or three miles to take a fresh grip in a new place. And now, having got a double hold, the Medway, which is two miles further to the west, is ordered to grapple for it also; and having caught it to heave up with all force even to the breaking of the cable. This is done, and the cable brought up within three hundred fathoms, and there broken. This at once lightens the strain and gives them an end to pull up on. 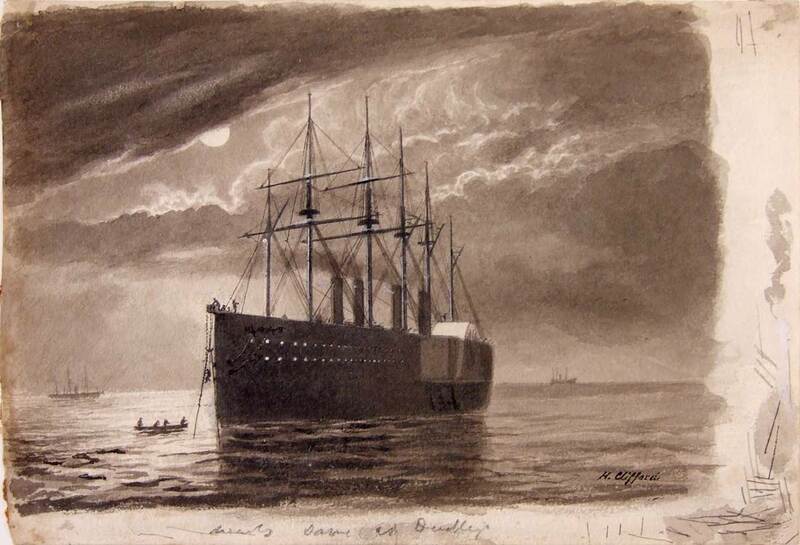 And now, having a lighter weight on the rope, the Great Eastern draws up again, but still gently, watching the strain, lest the cable should break. These operations are very slow, and last many weary hours. It was a little before midnight on Friday night that the cable was caught, and it was after midnight Sunday morning that it was brought on board. How long that day seemed! Night turned to morning, and morning to noon, and noon to night again, and still the work was not done; still the great ship hung over the spot where its treasure was suspended in the deep. The sun went down, and the moon looked forth from driving clouds upon a scene such as the ocean never saw before. At a distance could be discerned the black hulls of the attendant ships, the Albany, and the Medway. But why are they thus silent and motionless in the midst of the sea? Some mysterious errand brings them here, and as their boats approach with measured sweep, at this midnight hour, it seems as if they came with muffled oars to an ocean burial. It was still calm, but the sea began to moan with, unrest, as if troubled in its sleep. As midnight drew on, the interest gathered about the bows of the Great Eastern. The bulwarks were crowded with anxious watchers, peering into the darkness below. Still not a word was spoken. Not a voice was heard, save that of Capt. Anderson, or Mr. Halpin, or Mr. Canning, giving orders. 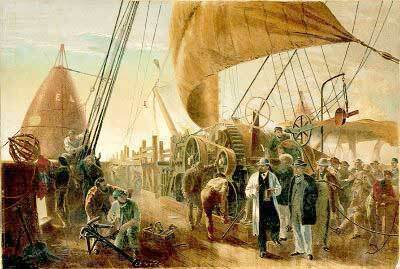 Henry Clifford, the mechanical engineer who designed the cable machinery and was second in command of the expedition under Samuel Canning, also made a painting ofthe Great Eastern recovering the cable. This watercolour by Clifford, now at the National Maritime Museum (to which it was donated by his grandson, Henry Dalton Clifford), has a pencilled note: “same as Dudley”. When once it was made fast, all took a long breath. The cable was recovered. They had the sea-serpent at last. There the monster lay, its neck firmly in their gripe, and its black head lying on the deck. But even then there was no cheering, as when they caught it two weeks before. Men are sometimes stunned by a sudden success, and hardly know if it be not all a dream. So now they looked at the cable with eager eyes, but without a word, and some crept toward it to take it in their hands, to be sure that they were not deceived. Yes—it is the same that they paid out into the sea thirteen months before! “I made my way with others, in accordance with an invitation from Willoughby Smith, to the electricians’ room. Here, after another hour’s preparation, during which time the cable had been carefully passed round the drums of the picking-up machinery, and a sufficient length drawn in on board, the severed end was received. And now, in their mysterious, darkened haunt, the wizards are ready to work their spells upon the tamed lightning. Not ‘unholy spells’ are these, or secret; for, though the wizards’ den is but of limited dimensions, they have not been averse to the presence of a few visitors. Mr. Gooch is looking on; Professor Thomson, be sure, is here, a worthy ‘Wizard of the North;’ Cyrus W. Field could no more be absent than the cable itself; I think, too, Canning, hard at work as he is forward in the ship, must have dropped in just for a moment; Clifford, Laws, Captain Hamilton, Deane, Dudley—all have, in their several ways, a great interest in every movement of Willoughby Smith and his brother (and able assistant) Oliver; and, when the core of the cable is stripped and the heart itself—the conducting wire—fixed in the instrument, and these two electricians bend over the galvanometer in patient watching for some message from that far-off land of home to which the great news has just been signalled, then the accustomed stillness of the test-room is deepened; the ticking of the chronometer becomes monotonous. “Night and day, for a whole year, an electrician has always been on duty, watching the tiny ray of light through which signals are given, and twice every day the whole length of wire—one thousand two hundred and forty miles—has been tested for conductivity and insulation. . . . 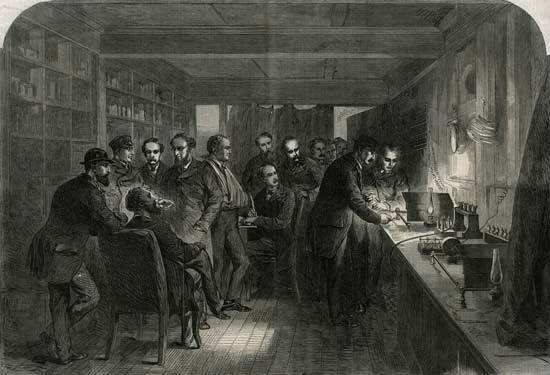 The object of observing the ray of light was of course not any expectation of a message, but simply to keep an accurate record of the condition of the wire. Sometimes, indeed, wild, incoherent messages from the deep did come, but these were merely the results of magnetic storms and earth currents, which deflected the galvanometer rapidly, and spelt the most extraordinary words, and sometimes even sentences of nonsense. The telegraphic fleet remained together but a few hours after this recovery of the lost cable. The battle was gained, and the three ships were no longer needed. The Albany, therefore, parted company to pick up the buoys and at once sailed for England, while the Great Eastern, attended by the faithful Medway, turned to the west. It was about nine o’clock that the ship began to pay out the cable. Up to that time it had continued calm, but the morning was raw and chill, and the sea began to rise as if in anger at those who had torn from it its prey. Capt. Anderson looked anxiously at the signs of the coming storm. How providential it seemed that the wind had been kept back during the critical hours when they were lifting the cable! But now the tempest was upon them, and for thirty-six hours it swept the ocean. All trembled lest they should not be able to hold on. But little incidents sometimes turn the current of one’s thoughts, and give a feeling of peace even in the midst of anxiety. The scene at Heart’s Content, when the telegraphic fleet appeared the second time, was one that beggars description. Its arrival was not unexpected, for the success on Sunday morning, that had been telegraphed to Ireland, was at once flashed across the Atlantic, and the people were watching for its coming. As the ships came up the harbor it was covered with boats, and all were wild with excitement; and when the big shore-end was got out of the Medway, and dragged to land, the sailors hugged it and almost kissed it in their extravagance of joy; and no sooner was it safely landed than they seized Mr. Canning, Mr. Clifford, and Mr. Field in their arms, and raised them over their heads, while the crowd cheered with tumultuous enthusiasm. The voyage of the Great Eastern was ended. Twice had she been victorious over the sea. Twice she had laid the spoils of victory on the shores of the New World, and her mission was accomplished. All on board, who had been detained weeks beyond the expected time, were impatient to return; and accordingly she prepared to sail the very next day on her homeward voyage. The Medway, which had on board the cable for the Gulf of St. Lawrence, remained two or three weeks longer, and with the Terrible, whose gallant officers had volunteered for the service, successfully accomplished that work. But the Great Eastern was bound for England, and Mr. Field had now to part from his friends on board. It was a trying moment. Rejoiced as he was at the successful termination of the voyage, yet when he came to leave the ship, where he had spent so many anxious days and weeks, both this year and the year before; and to part from men to whom he was bound by the strong ties that unite those embarked in a common enterprise—brave companions in arms—he could not repress a feeling of sadness. It was with deep emotion that Capt. Anderson took him by the hand, as he said, “The time is come that we must part.” As he went over the side of the ship, “Give him three cheers!" cried the commander; “And now three more for his family!” The ringing hurras of that gallant crew were the last sounds he heard as he sunk back in the boat that took him to the Medway, while the wheels of the Great Eastern began to move, and that noble ship, with her noble company, bore away for England. The Metropolitan Museum of Art in New York has a large collection of works by Robert Dudley, given in 1892 by Cyrus Field. The works include most of Dudley’s original watercolours for Russell’s The Atlantic Telegraph. On board the steamship Great Eastern. The “Test Room” on the night of Sept. 1st, 1866. The first message sent from Lat. 51'52', Lon. 36' 5', to Valencia, through the recovered cable of 1865. Waiting the reply. Portraits introduced: Cyrus W. Field, John Temple, Daniel Gooch, J. Griffith, James Anderson, Samuel Canning, Augustus Hamilton, William Thomson, Henry Moriarty, Willoughby Smith, Robert Dudley, Henry Clifford, John Deane, Oliver Smith, H. Sawyer. 8: John Temple? 12: Henry Clifford?